White Peach Sangria with white wine, what a perfect spring/summer drink! Sangria normally consists of wine, chopped fruit, a sweetener and some brandy. For a fruit, you can use: oranges, lemons, limes, apples, peaches, melons, berries, pineapple, grapes, kiwi, and/or mangoes. For a sweetener, you may use: sugar, syrup, honey, or orange juice. Finally, you can also consider replacing the brandy with seltzer or a lemon/lime soda. 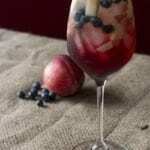 Note: The picture shows a little red wine and blueberries thrown in the White Peach Sangria for color. We’ll be posting additional recipes in the future, you’ll be able to find them all on our recipes page. Add liqueur and lemon juice to the bottom of a pitcher. Dice peaches into cubes and add ice. Finish with white wine and serve immediately. Don’t forget: you can also keep up to date via our newsletter. You can subscribe to our newsletter on our Contact page.